Omelets are a popular egg dish that many people make for breakfast and sometimes dinner as well. Omelets are not particularly difficult to make, but the rolling or folding they require can be difficult if you don’t have the right pan. An omelet pan is a special pan that is used to cook omelets and other types of eggs. Depending on your needs, there are a few different types of omelet pans to choose from including traditional, French, and Japanese. Each style is made a little differently and works well for specific types of egg cooking. If you like to cook omelets often, you want to find a pan that makes it easy to achieve the quality omelet you are looking to cook. We have highlighted the top-rated omelet pans that will make cooking omelets and other egg dishes simple and easy. One of these pans mentioned in the list and reviews below will be the perfect addition to your kitchen that will enable you to cook omelets, scrambled eggs, and other dishes successfully. Cook perfect omelets with the Calphalon Aluminum Omelet Pan. Made from heavy-gauge aluminum, your omelets will cook evenly all the way through. The hard-anodized aluminum is extra durable, so the pan lasts a long time. The three-layer nonstick coating provides strength and easy release of your food so there is no sticking. The handle of this omelet pan is made from brushed stainless steel which stays cool to the touch even when on the burner. The pan, lid, and cover are oven safe as well for specialty dishes that require baking to finish. The wide bottoms of the pans provide plenty of room and the sloped sides make rolling or tossing your omelet easy. These two omelet pans measure 10” and 12” and come with a full lifetime warranty. The dual, nonstick layers used in the construction of this omelet pan ensure easy food release so you don’t have to worry about your omelets sticking and getting messed up. The Calphalon Jumbo Omelet pan is made from hard-anodized aluminum for lasting durability. The long handle is made from stainless steel and stays cool even during the cooking process. This omelet pan is oven safe up to 450 degrees. The high sides and deep cooking area make this pan perfect for omelets and many other kinds of food, including deep frying. The materials used in construction allow for even cooking so your food comes out perfect. This 12” pan comes with a cover so you can minimize splattering. Cleanup is super easy, just wash in soapy water and dry before putting away. The Calphalon Jumbo pan comes with a lifetime warranty. Nordic Ware Omelet Pan is perfect for cooking delicious omelets and other dishes for your family. The nonstick coating makes food release simple and easy and also makes cleaning up simple as well. The hinge design of the pan eliminates making a mess during the cooking process so your food looks as good as it tastes. The design is easy to flip due to the design and two handles. Both sides cook evenly so you can create delicious frittatas, omelets, and other foods that your friends and family will love. The Japanese omelet pan allows users to make perfect Japanese rolled omelets. The sloped shape makes flipping sandwiches, omelets, and even pancakes simple and easy. The durable cookware from TeChef provides a non-stick coating that makes food release and clean up easy and quick. The non-stick surface also allows for less fat and oil to be used during the cooking process. There is no PFOA used in construction of this omelet pan. The beautiful Aubergine color looks great in any kitchen and really stands out. The company provides a warranty that covers any manufacturer’s defects and lasts throughout the lifetime of the original owner. 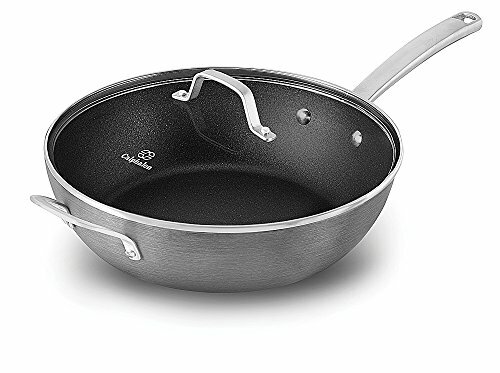 This pan is made from stainless steel (bottom of the pan), aluminum, and new Teflon non-stick coating and will last a long time with proper care. The top rated omelet pans we have reviewed and listed above live up to their reputations and help make cooking much easier and more enjoyable to boot. If you purchase one of these omelet pans you will have a much easier time creating the kind of omelets and dishes your family and friends will love. The different styles of omelet pans available cover many different cooking styles so you can find one that is perfect for your specific needs and preferences. The buyer’s guide below will help you sort through all the different brands and styles of omelet pans so you get the best one for your money. Once you have the knowledge you need to identify the differences between the various omelet pans on the market, you’ll find that choosing the right one for your kitchen very easy. The French word “Omelette” came into use during the mid-16th century. There are several things you should know about omelet pans and cooking omelets before you purchase a pan for your kitchen. With the right kitchen tool (the right pan) you will find cooking omelets becomes much easier and fun even for the most inexperienced cook. We’ve listed these things below so you are better equipped to make a good choice. Hefty Pans – As with most types of cookware, heavier omelet pans are better to cook with than lightweight, flimsy ones. A heavy pan will control the heat better and cook more evenly. One of the best materials is copper that has been lined with stainless steel. These cook quickly, evenly, and cool off fast once you take them off the burner. Anodized aluminum is another material that is a favorite with chefs. Cast iron is excellent to cook with especially when it has been seasoned properly, but if you are new to cooking you will probably have an easier time looking for an omelet pan that has a good quality nonstick coating. Shape is Important – The best shaped omelet pan is going to be oval or round. There are square omelet pans on the market but they are not as easy to use when flipping or rolling the omelets and can cause frustration. The perfect sized pan for single omelet cooking is around 6-10 inches in diameter with sloped sides and a good quality handle. Non-Stick surface is best – There is nothing more frustrating than spending time cooking a great omelet only to have it stick to the pan and get messed up. Non-stick surfaces on the omelet pans prevent this mishap from occurring. Although non-stick surfaces prevent food from browning, this is not a problem when it comes to making great omelets. A pan that heats up a little slower and does not brown the food is the perfect pan for an omelet. Cool touch Handles – The handle of your omelet pan is important since you use it during the cooking process. For this reason, stay-cool handles are best because they can be grabbed during the cooking process without worry of burning the user. Pot holders are not always easy to cook with which is why you want a pan that you can grab without having to grab the potholder first. Wooden handles are cool to the touch during the cooking process but wood handles are not oven safe typically and don’t do well in the dishwasher either. Hard plastic handles are also not oven-safe and can melt in the oven or under the broiler. 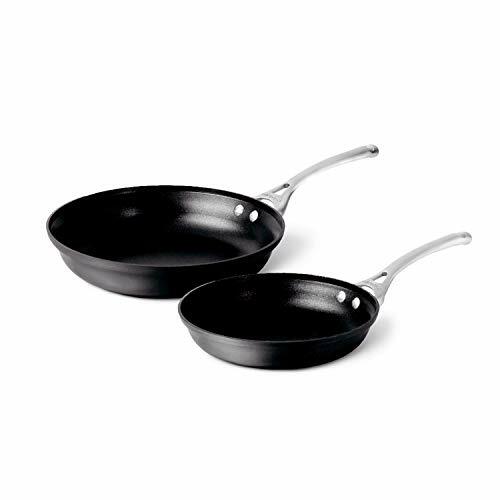 Thick, Flat Bottom Pans – the ideal pan for cooking omelets has a bottom that is thick and flat. This allows heating at high temperatures without having hot spots. The heat is evenly distributed and that means great tasting omelets that are cooking perfectly. One of the best materials to look for in the base of your pan is aluminum since it is good for fast heat transfer and even cooking. Sloped or Flared sides –the sides of your omelet pan are a major part of how easy it is to roll or flip your omelet during the cooking process. Sloped sides make it easy to flip your food as it cooks and the flared sides make sliding the omelet out of the pan and onto the plate super easy. Easy Maintenance – Choosing a pan that is dishwasher safe is the best way to ensure easy cleanup. Pans that have to have special care such as cast iron can be a hassle for some cooks that do not like to spend time doing extra maintenance. The good thing about cast iron, though, is that when it has been seasoned properly all it needs is to be wiped clean. Stainless steel is dishwasher safe and easy to clean which makes it a popular material. Aluminum, on the other hand, has to be washed by hand and needs special cleaners to prevent damage. Choosing the wrong material for your omelet pan can result in an omelet that sticks and falls apart or that is unevenly cooked. The type of material an omelet pan is made of determines not only how well the omelet comes out but longevity, heat conduction, and corrosion resistance as well. The materials listed below are most commonly used in the construction of omelet pans. Anodized Aluminum – This type of aluminum is stronger than regular aluminum but doesn’t conduct heat as efficiently. Aluminum – This material is an excellent heat conductor. It is inexpensive, durable, and lightweight. There are some problems associated with regular aluminum including being scratched easily, warps easily, discoloration, and having reactions to acidic foods. Carbon Steel – This lightweight material is very durable and is a great conductor of heat. It is not dishwasher safe which can be a problem for those who do not like having to wash pans by hand. Stainless Steel – This hearty, heavy material is known for its resistance to damage and its longevity as well. It’s not as good as conducting heat as other types of materials but it is rust resistant and will last a really long time. Food can stick to stainless steel is care is not used during the cooking process. Copper- Copper is one of the most popular materials for kitchen cookware because it is fantastic at conducting heat and because it looks so beautiful as well. The problem with copper is that it can react to acidic foods giving everything a decided metal taste. One way around this is to look for copper cookware that is combined with stainless steel. There are three different types of omelet pans on the market. Each one is slightly different and has its pros. Traditional – A traditional omelet pan looks a lot like a round frying pan. It is easy to use and has a long handle for simple maneuvering. 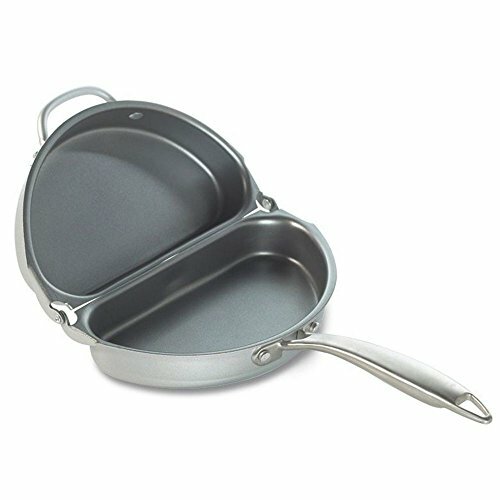 French – the French omelet pan has a curved design that is very shallow so you can turn and/or flip the omelet during the cooking process very easily. 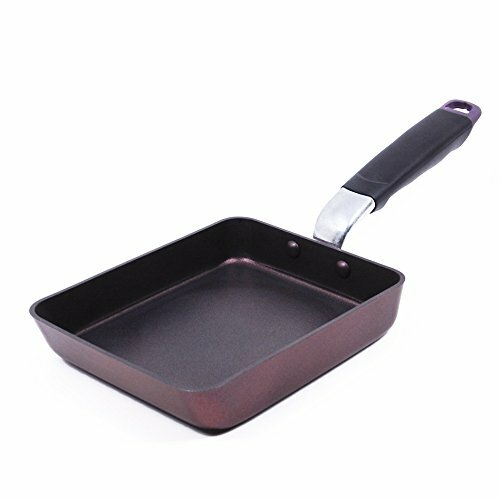 Japanese – Japanese omelet pans are made of iron and feature a square shape and typically a deep, rich color. Choosing the right omelet pan does not have to be difficult if you know what you’re looking for. Before beginning your search, take a few minutes and decide what you really want in an omelet pan. If you are an experienced cook, a pan made of cast iron may be your favorite thing. If you have not been cooking long or you don’t like messing with special care instructions, look for pans that have non-stick surfaces and that are dishwasher safe and easy to use. The top rated omelet pans we have featured above are all quality products that will provide you with the tools to cook delicious and great looking omelets with ease. The sloped sides, long handles, non-stick surfaces, and quality construction make these top rated omelet pans customer favorites. The buying guide above has furnished all the information you need to sort through the many different kinds of omelet pans and narrow down your choices so you can choose one that will meet your needs in all ways from easy cleanup to safe handling during the cooking process. There are many different brands and styles to choose from and they come in a variety of sizes as well. Many people purchase a few different styles so they can cook on a smaller scale for one or two people or cook larger amounts when the whole family is in the mood for a great omelet. Take the information we have provided, separate out several of your favorite omelet pans and compare them against each other so you purchase the one that will meet your needs and provide you with the right tools to create yummy omelets that your whole family will enjoy.